This WordPress theme comes with an amazing creative design and 6 months included support. It is a responsive and retina-ready WordPress theme with grid system layout. It has a fantastic balance between a lovely design and lot of functionalities. 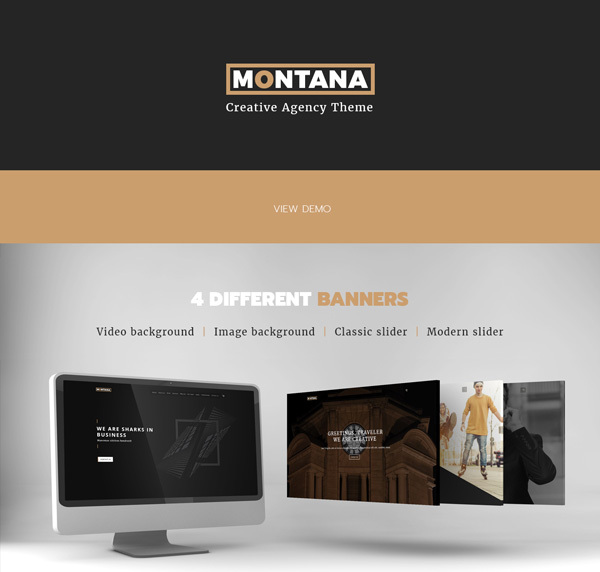 Montana is compatible with Bootstrap, WooCommerce and its unique layouts allow you easily create a great looking website. The theme gives you the ability to customize the look of your portfolio without having to dig into code. You can choose a desired number of columns for each portfolio. With Portfolio masonry: Box/Fullwith you can make your portfolio page display in an amazing masonry layout.There are also available grid and flat Box/Fullwidth portfolio options. Just have a look to it right away. Montana comes with a complete options panel that lets you control every single part of the theme. It is easy to import and highly customizable.